Elastic band resistance products were initially designed for rehabilitating and restoring muscle and joint functions; today, they are also used for improving conditioning, balance and building strength in all individuals (Theraband Company Overview, 2006). Elastic band (variable resistance) differs from constant external resistance (free weights) in that the load changes throughout the range of motion. 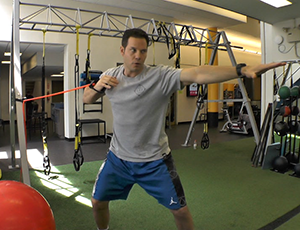 Variable resistance bands can be used to increase load at end ranges of motion where individuals are strongest (barbell squats,) or help them break through sticking points in movements where they are the weakest (the bottom range of a pull-up.) Elastic bands have also been show to help improve rate of force development; an important consideration in training for powerful sporting movements (Wallace, et al, 2006). 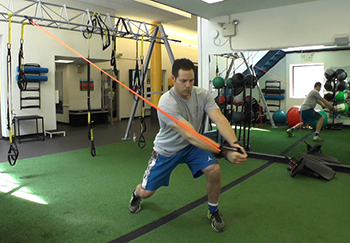 Variable resistance training using elastic bands is a low cost, portable, efficient and effective modality, which can be used to enhance conditioning regardless of ones fitness level. This article will explore how to incorporate elastic resistance into one’s training program with a focus on: strength development, speed enhancement and improving eccentric control. Reader will be able to articulate at least one reason why variable resistance training is advantageous relative to constant external resistance training. 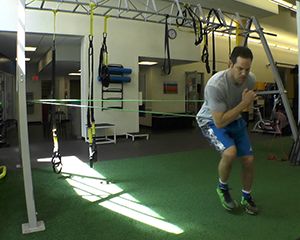 Reader will be able to identify two reasons speed training is important for sports and activities of daily living. Reader will be exposed to a sample of elastic resistance exercises designed to enhance strength, speed and eccentric control. Strength is influence by physics related to joint structure. For instance, in some movements we are strongest towards the end range of motion (squats or deadlifts) in which we have a mechanical advantage of multiple joints going into full extension. In other movements our strength actually decreases towards end range (pull-up or rows) providing less mechanical advantage at end range and a “sticking point” at the start of the motion. Using elastic resistance in conjunction with free weights has shown to produce more strength benefits than using free weights alone in these instances (Cronin, Mcnair & Marshall 2003.) A simple way to increase motor unit activation and challenge clients where they are strongest for movements like the squat, is attaching elastic resistance (see images on left). In this configuration the elastic resistance produces increasing loads at the top range where the client is strongest; recruiting more muscle fibers and enhancing metabolic effects of the exercise. 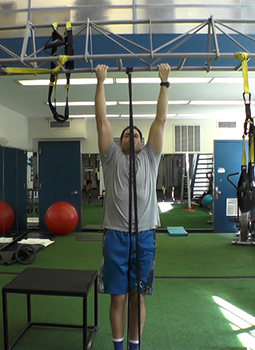 Conversely, in the pull-up movement the most challenging position is at the beginning of the movement where there is a “sticking point” that can be difficult to get past (often forcing trainers to steer clear of this exercise.) The use of elastic resistance can assist the client on the initial pull giving them some momentum and confidence to engage in this tremendously beneficial exercise (see images below). The use of elastic resistance is a simple and effective way to both challenge and assist free weight & body weight loaded exercises helping to improve strength and durability. 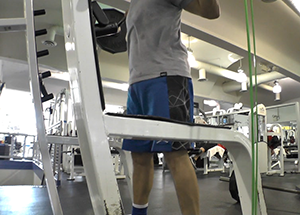 Two exercises that should be in any trainer’s arsenal are the rear hand punch and the high to low standing chop. The rear hand punch combines the foundational movements of pushing, pulling and rotation and taps into something called the serape effect. The serape effect is how the body summates internal forces for rotational power (Logan & McKinney 1970) and was covered in detail in my last article Going on Strike: Two of the Greatest Exercises You Have Never Performed. The mechanics of the punch are important as the rear foot, knee, hip and shoulder should drive towards the target concurrently; while the opposite scapula should be pulled aggressively into retraction (see images on right). The high to low chop uses similar principles but requires more aggressive cylinder rotation and advanced footwork (double foot pivot mechanics), which helps train the agility component of power development (see images below). Although the goal of these movement patterns is for speed/power development, the patterns must be well rehearsed prior to layering in speed. Focus on mechanics and fluidity early on and allow the speed to build over time. Although linear speed is often the benchmark for testing athletes (ie: 40 yard dash times,) it’s an athlete’s ability to decelerate and change direction that makes them agile (think 2015 NBA MVP Steph Curry.) The previous paragraph focused on speed/power production using elastic resistance; however, “the benefit of speed training it that it also aids in the training of adaptations in the sensory motor system that enhances the athlete’s ability to brake, sometimes referred to as the “restrain mechanism”” (Swanik, Lephart & Huxel 2002). 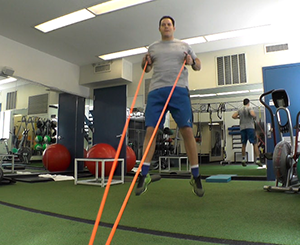 The use of elastic resistance causes the greatest amount of force to be exerted at the end range of motion (as the resistance cord is put on maximal stretch). Creating greater force at the end of the concentric contraction creates greater acceleration earlier in the eccentric loading phase (enhancing the stretch reflex and challenging the muscles to control movement in a weaker shortened range). 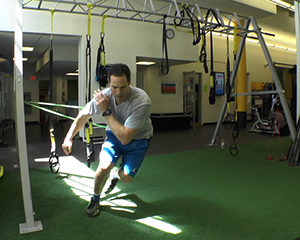 By training acceleration and controlled deceleration we not only enhance athleticism, we train the central nervous system to help mitigate injury that often occurs during the eccentric phase of movement. 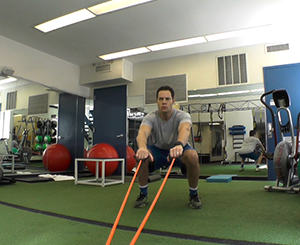 Two exercises that highlight this type of training are the skater and jump squat row. The skater is a fantastic move, which is scalable for any level client. Proper execution of the skater has a focus on the deceleration phase in which the lateral hip musculature helps maintain alignment of the hip and knee. It is also very important to note the role of the core in this drill; the core must fire to maintain a neutral spine position assisting in maintenance of one’s center of gravity for increase power and reduced injury risk (see images on left). The squat jump row is also scalable and can progress from a squat row, to a squat row with plantar flexion to a jump squat row. Again, this drill is designed to have a focus on the deceleration following triple extension. The hips must drive down and back while the spine stays in neutral to control position for the subsequent jump (see images below). 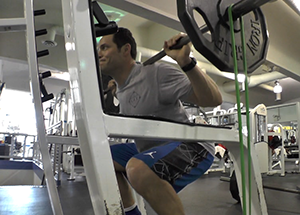 Full proficiency will allow for repeated jump squat rows without having to reset position upon landing. 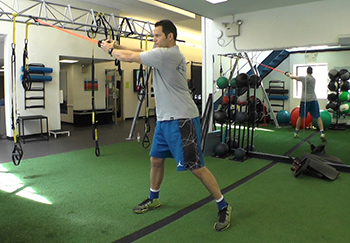 With both drills users need to focus on pausing prior to the concentric phase of the lift; this will slow things down just enough to better control the movement and build total body stability. 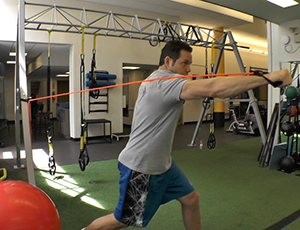 Although elastic resistance has its roots in rehabilitative medicine, it has more recently become commonplace in strength and conditioning environments. Elastic resistance is lightweight, portable, scalable and inexpensive, making barrier to entry on this product minimal. More importantly, its ability to assist in training for strength, speed and eccentric control makes elastic resistance a viable training modality. 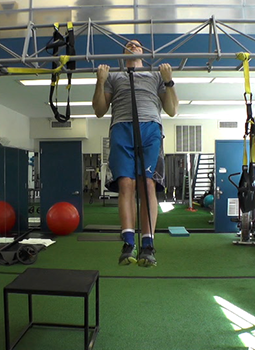 For more detailed information on how to perform the exercises highlighted in this article please view the video below. Logan, G., Mckinney, W. (1970) Kinesiology. William C Brown. Los Angeles, California. Theraband. (2006) Theraband Company Overview. Akron: Hygenic Corporation. Turner, A., Baker E., & Miller S. (2011) Increasing the Impact Force of the Rear Hand Punch. Strength and Conditioning Journal, 33 (6), 2-9. Wallace BJ, Winchester JB, and Mcguigan MR. Effects of elastic bands on force and power characteristics during the back squat exercise. J Strength Cond Res 20: 268–272, 2006.